A nation that was once of super power status who dominated and controlled almost half of Europe during the Middle Ages. 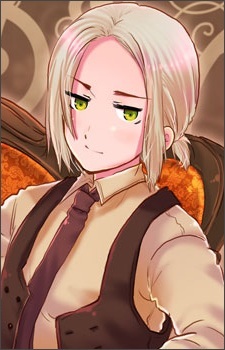 He has shoulder length blonde hair and green eyes, but in earlier artwork, his eyes were colored blue. He is best friends with Lithuania, whom he calls "Liet" (derived from "Lietuva" which means "Lithuania" in Lithuanian). Back during the Middle Ages, they were partners in conquering Europe. The two are very close, but Lithuania seems to have the short end of the stick in their friendship, constantly being dragged around by Poland. Poland doesn’t care if Lithuania ever hates him because he knows that he’ll always like him no matter what. To this day, there is little border protection between the two, still showing a definite sign of their closeness. Poland’s true personality is hidden behind his air-headed and somewhat spacey appearance. He seems to be really tough, but is actually very shy, especially around strangers, and it takes him a long time to get used to someone. However, he is clingy and quite bothersome once he gets to know you. He usually doesn’t think before he acts, is somewhat selfish, and is forceful with his opinions, but is very cheerful. He is used by other countries often, mainly because of his impulsiveness. Eventually, he was divided up by other countries, but kept “rising” back, similar to a phoenix. From this, we can easily see that Poland is quite a strong country. He's also known for having a pretty awesome national anthem. It is apparent that Poland crossdresses as a hobby, and that he talks in a Nagoya high school girl dialect (which is literally just a “valley girl” accent). Also to note is that Poland was originally designed to be female, a role that was later given to Hungary who was supposed to be a cross-dressing male.